It is now 8:00 a.m. EST on Thursday 27 October 2011. Early data from the GOES satellite and hurricane-hunter aircraft is that Hurricane Rina has continued to weaken during the night, a trend that started some 24 hours ago, as it feels the effects of wind shear resulting from its clash with a ridge of high pressure over the Gulf of Mexico, a rather dry atmosphere to the west and north of its path and the early effects of a cold front now moving south and east over the southern USA. Early reports from National Hurricane Center forecasters are that this tropical cyclone is barely a hurricane, with surface winds estimated at 110 kph. 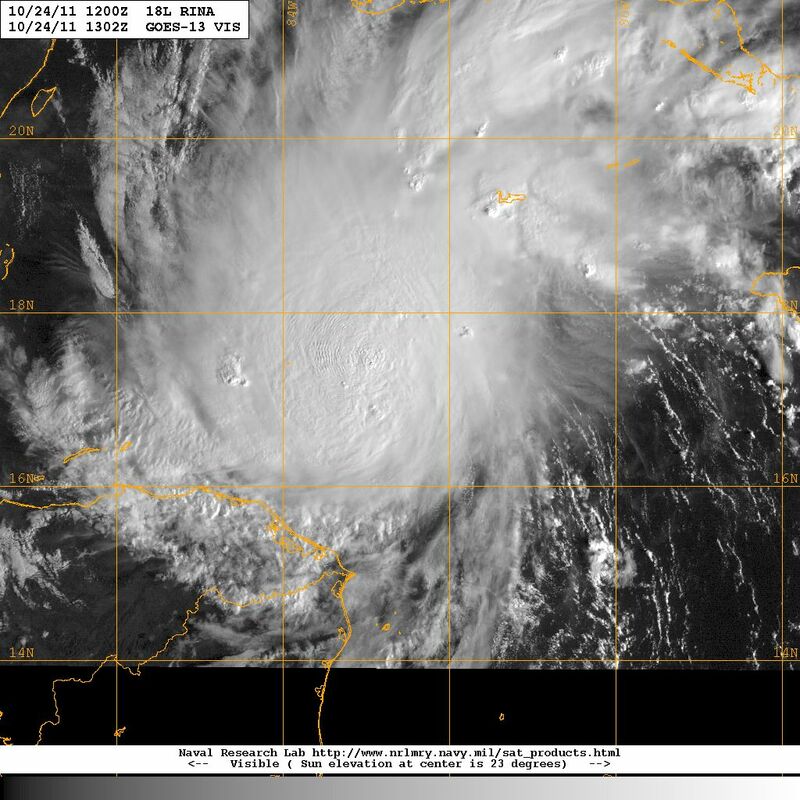 Visual clues empirically confirm what the data are telling us, the overall size of the system is perhaps half of what it was just 48 hours ago, the perimeter has a jagged appearance as wind shear is taking its toll, the eye is not readily discernible, and the outflow from the top of the storm is almost absent: all of these are signs of a weakening system. RINA has shifted its track as it continues its progressive turn toward the north, and it is now moving northwest by north at 10 kph. At this rate and direction the storm appears headed for an impact over the general area of Playa del Carmen – Cozumel-Cancun, in the state of Quintana Roo in Mexico’s Yucatan Peninsula during the night tonight. In considering what this projected track might mean for various interests around the Caribbean sub-basin and in Florida, the main questions becomes: what will happen to RINA intensity-wise as it follows such convoluted path in 4 or 5 days from today? As a weakening system, which is projected to continue weakening, will RINA survive as a tropical cyclone in 4 or 5 days. From previous discussions we have seen that if predicting the track to be followed by a tropical cyclone is difficult, it is even more difficult to predict what the intensity of a storm may be 2 to 3 days hence, and extremely more so when we are talking about 4 or 5 days from today. The general thinking has RINA decaying to tropical storm strength as it interacts with land over Quintana Roo and continues to sustain the effects of the various external factors already mentioned here. 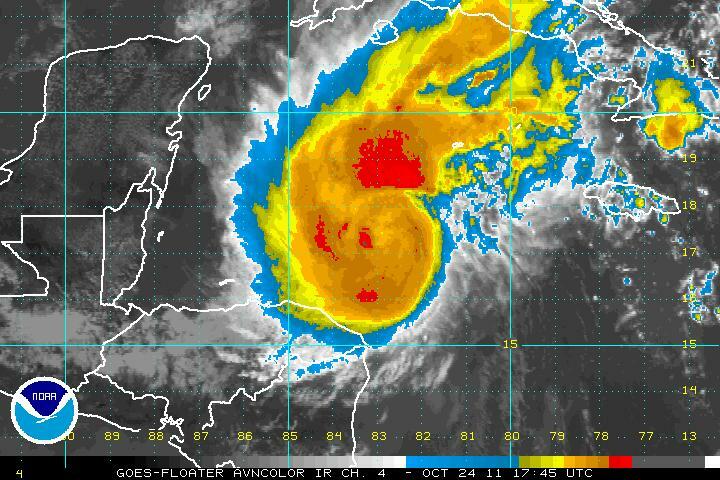 What will happen as RINA re-emerges over waters in the Gulf of Mexico? Given the adverse environment that will prevail over that region over the next several days it appears unlikely the storm would regain strength at that time, consequently we might be might see only the remnants of RINA making the hairpin turn in the projected track 4 – 5 days from now. What does it all mean for communities in the path of RINA, such as vulnerable communities in the coastal region of Quintana Roo, Mexico? What about Tulum, Xel-Ha, Playa del Carmen, Cozumel, Puerto Morelos, Cancun, Isla Mujeres and the numerous resorts along the so-called ‘Riviera Maya’? My recommendation to all those communities that will suffer, in varied measure, the impact of RINA, is do not let your guard down and be deceived by a weakening storm. Winds of 100-120 kilometers per hour, possibly gusting to 140-150 kph can be quite damaging generating considerable flying debris, with the potential for causing injury or even death as well as damage to buildings and structures. Storm surge and superimposed waves have the capacity of exerting tremendously strong impact loads on buildings and infrastructure in the coastal region in addition to causing severe beach erosion. From communications with contacts in Quintana Roo I know for a fact that Civil Protection authorities have activated emergency plans, which include evacuation of tourists from coastal resorts. Civil protection authorities in Quintana Roo have an excellent record of proactively activating emergency plans, convening emergency committees at the municipal level, and of protecting the lives of visitors and residents alike from the impacts of tropical cyclones their state suffers with some frequency because of its geographic location. 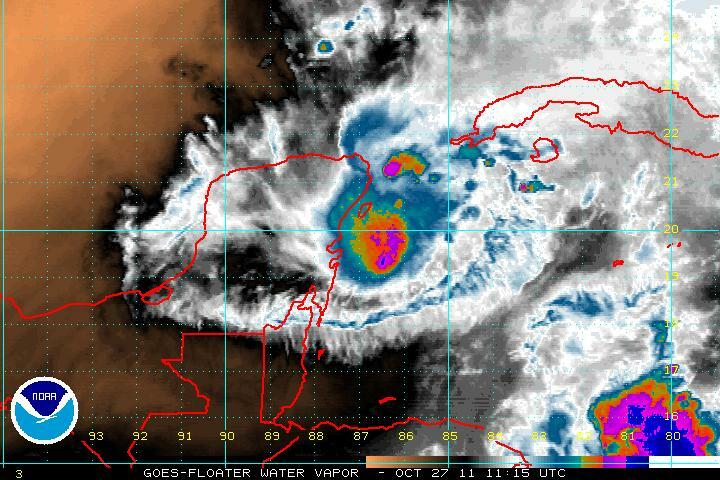 What else is happening in the Caribbean or elsewhere in the larger Atlantic basin? 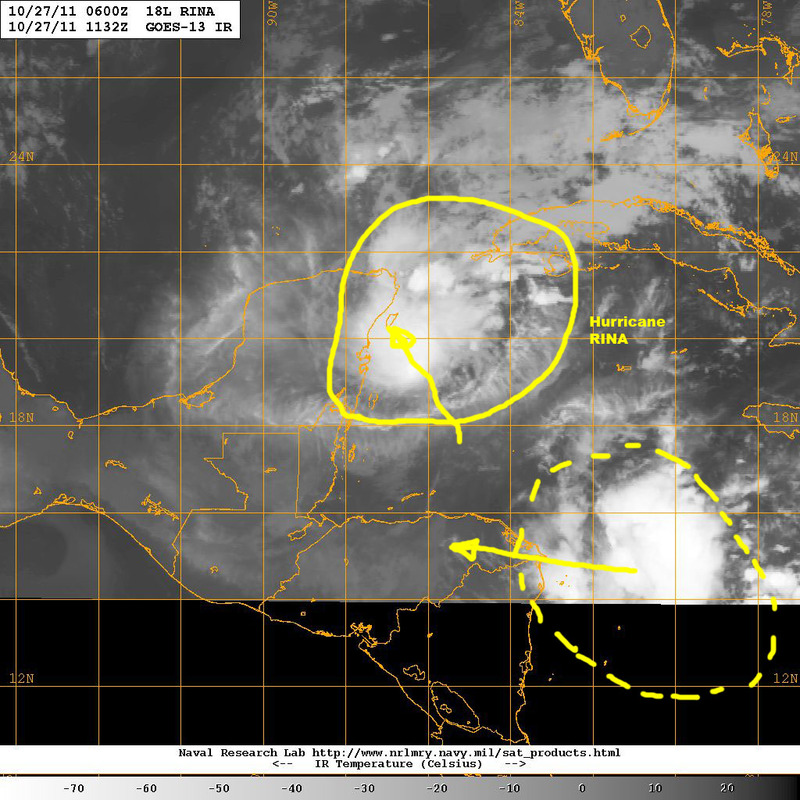 For starters, the tropical wave of low-pressure that was active in the southeastern Caribbean and moving westward has become disorganized, and it shows low to no probability for further development. 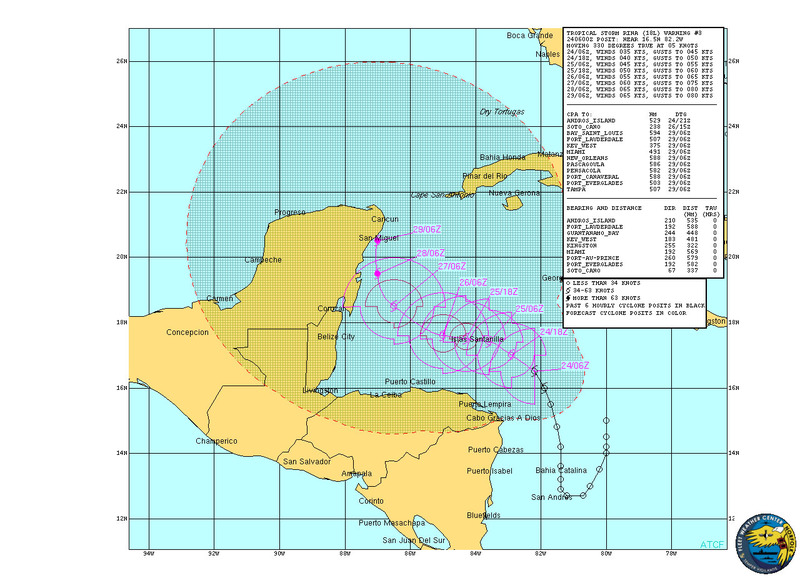 This system has been moving at a rather fast clip of 20 – 25 kph and it is now a large cell of disturbed weather, with plenty of thunderstorm activity and heavy precipitation, located to the east of the Nicaragua/Honduras border and continuing to move generally westward at approximately 20 kph. 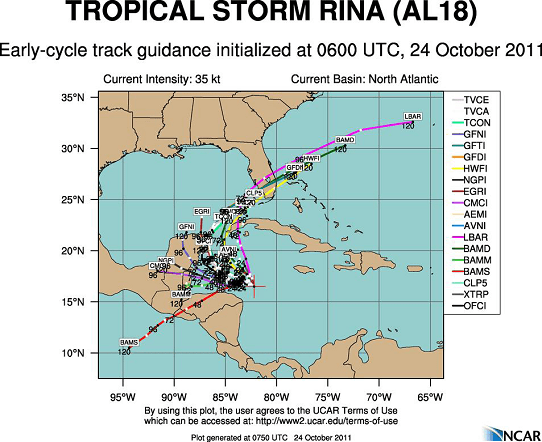 What is interesting about this system has been its fast pace of forward movement especially when compared to the rather slow pace at which RINA has been moving, which raised a remote potential for some interaction between both systems. An interesting question would be, if the remnants of RINA as it recurves back into the Caribbean and those of this other system, may not generate some sequel should they happen to interact in the future? Relative to this, it wouldn’t be the first time we see the remnants of a system in the Caribbean interact with another and be re-energized to become something totally new, even a new tropical cyclone. Farther east other than a couple of areas of rain over ‘hurricane alley’ and the eastern Atlantic there is nothing, for now at least, showing potential for cyclonic development. Tropical waves over equatorial Africa continue to develop, and although such activity has shifted southward toward the equator there is still some potential for any one of these waves to emerge over the eastern Atlantic and head toward the Caribbean. So, as I always say: pay attention! Be prepared!! MITIGATE!! !